More Power and Productivity… Control All Your Systems with One Console! 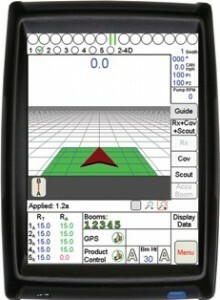 The Viper Pro multi-function field computer is the best in its field with extra power and capability to drive even the most advanced system functions with ease. For professional operators and larger growers looking for the ultimate in productivity and performance, Viper Pro is built to deliver. Empowering your potential. Viper Pro brings your system functions to life—and has the power to make sure they live up to their potential. Guidance and steering, variable rate application, wireless communications, boom control, real-time weather records, data mapping—and a whole lot more. Simple, seamless operation. The genius behind Viper Pro’s advanced capability is its simplicity in design and operation. Simple things like our common sense programming and industry-compatible software and equipment offer smooth, trouble-free operation so you can relax while you go about your business. Ready to grow. Scalable. Viper Pro gives you the freedom you need to step up your system capabilities when the time is right. From RTK sub-inch accuracy to high speed hydraulic assisted steering, automatic boom height and section control, and up to five-product VRA capability—Viper Pro is ready to grow when you are. Guiding you toward profitability. Viper Pro benefits go straight to your bottom line—especially when you consider Viper Pro’s powerful time-saving and productivity-enhancing features. With Viper Pro in your cab, you can know more, control more—and make more. High-powered Windows XP operating system gives Viper Pro the extra memory and processing power you need to maximize your system functions and capability in every area. The sturdy RAM-mounted console gives you complete system control with the touch of a finger. 10.4” diagonal touch-screen display lets you see more and do more in every mode. Super-sized vertical screen profile also offers the best view inside without obstructing your view outside. First-to-market wireless Internet capability offers convenient in-cab data transfer, analysis and two-way communications, including access to 10 preset Web addresses and Raven’s remote support service. A great way to get more out of your time in the field with direct access to global networks when you need it! Scalable variable rate technology helps you get more out of your fields with less waste and fewer inputs. Viper Pro comes with standard one-product VRA and prescription map capability to start—and you can add VRA capability for a total of five products when you’re ready. With Viper Pro, importing and retrieving prescription maps is easy. Enhanced Last Pass guidance technology is easy to operate and perfect for irregularly shaped fields. Automatic correction intelligence and quick turnaround lock mode for enhanced line acquisition and more precise contour guidance throughout the field are now included. 3-D moving-map guidance display helps keep you on line in any pattern—straight, fixed curve, pivot and enhanced Last Pass. The super-sized vertical screen is easy to read—and doesn’t block your view of what’s going on outside the cab. Multiple screen views let you switch on the fly between downfield and bird’s-eye views to fit your operating needs at the time. Ideal for checking field coverage or skips one minute—and for spraying or planting the next. Another one of the many on-screen features that help you do more with less. Four field patterns to choose from means easier line acquisition and faster, more accurate field coverage. 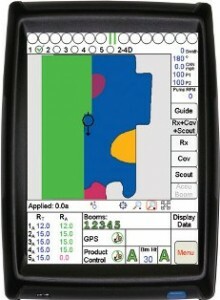 Patterns include straight A-B, fixed curve, pivot and Raven’s exclusive Last Pass feature for irregularly shaped fields. Real-time data mapping, field reports and record keeping give you the tools and information you need to improve your bottom line by saving time, reducing input costs and improving overall performance from one season to the next. The ultimate in convenience and simplicity. Optional WatchDog™ sprayer station helps take the worry out of spraying by recording real-time weather information as you drive. Temperature, wind speed, wind direction, wind gusts and more can be printed out later with your precise field location, application log and date/time stamp for the record. Three USB ports allow you to load and transfer field data and information easily—like time-and-date and Rx maps, coverage records, application rates, wind speeds, temperature, etc—with a simple thumb drive for better farm management and analysis. Efficient Rbin data format improves your ability to record, analyze and make the best use of field data. Rbin data is easily loaded on your desktop with a free desktop utility for easy record-keeping and printing of application reports. You can also convert your data to SHP files for use with other geo-referenced software programs. Industry compatible technology allows you to share, collect and print data from commonly used industry software and equipment without problems. With Raven, you don’t have to worry about proprietary or compatibility issues keeping you from doing what you need to do. Compatible with GreenSeeker® optical sensing and application for evaluating crop status as you spray—and automatically making sure your crops get the right amount of nitrogen at the right time and place for optimum yields and nitrogen savings.